ADD WEDDING HORSES TO FAVOURITES! Our white Wedding Horses for the ultimate Wedding experience for traditional Asian Indian Wedding Experience and the perfect start to a perfect marriage. Asian Wedding traditions are many and varied. From the remote mountains In Tibet where the White Horse is the day before the Asian wedding, brought by the Maternal Uncle of the Groom to the Bride's house (or Tent) taking along as gifts a white Wedding Horse for the bride to ride on. Throughout Pakistan, at Punjabi (Punjab) Weddings, to Mumbai (Bombay) in the South of India, and also in Sri Lanka, (Formerly known as Ceylon), at Asian traditional weddings, the Asian Groom arrives at The Wedding Venue to meet his Indian Bride on a White Wedding Horse decorated in traditional Red and Gold Wedding Cloth. In Tibet, the Bride rides a White Wedding Horse to her Uncle's house, preceeded by the Wedding guests, before arriving at the Wedding Venue with her husband to be in The White Indian Wedding Cart. At The Asian Wedding Venue, The Asian Groom, rides his traditional White Asian Wedding Horse on the Morning of the Wedding, to meet his Asian Bride at the Wedding venue. After the Wedding celebrations and festivities at the marriage, the Groom and Bride leave the venue, late afternoon, or early evening, relaxing comfortably in style and splendour in the luxurious red and gold velour upholstered seats of the White Indian Wedding Carriage, (Wedding Cart or Wedding Buggy). Then, the Asian Wedding photographers and videographers take the Asian Wedding photos. An Afghani marriage takes place in the evening, The Afghani groom mounts his White Wedding Horse around 10 PM in the evening to arrive at the Wedding festivities which begin around 7 PM in the evening, and continue into the early morning at the Wedding venue. Next day, after the Wedding celebrations, which last all through the wedding night and can continue for many Days, the Afghani Groom and Bride open their Wedding presents in the presence of the Wedding guests. For all Afghan weddings, remember to book Wedding Horses White Wedding Horse. Many Asian Grooms, wish to surprise the bride and Wedding guests by arriving at the Wedding venue on a traditional White Asian Wedding Horse. Wedding Horses have, together with the Asian Groom, surprised the Asian bride by hiding on the driveway of houses in Nuneaton with The Dhol Drummers Foundation, The Dhol Foundation Dhol drummers, in neighbours back gardens in Slough, in an alleyway across the road from the Gurdwara in Southall and even in the back of a Mc'Donalds car park in Heathrow International Airport in the early hours of a Sunday morning to arrive at The Marriot Hotel in Heathrow for Asian weddings, The Asian groom and the best man, together with close friends know that the bride and wedding guests will be waiting for the groom to arrive in a Wedding Buggy. 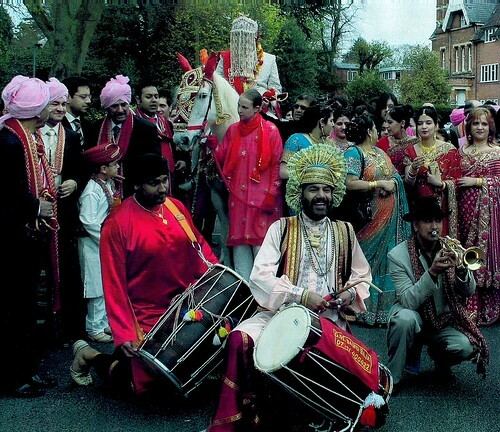 Imagine then, the surprise when the Groom appears at the wedding venue, on his traditional Shining White Wedding Horse following the Dhol Drummers and the Bhangra dancers, or The Bollywood Brass Band, to arrive in traditional splendour at the Indian Wedding Venue on his White Wedding Horse. Our White Wedding Horses have appeared in TV films, and as the Cosmopolitan Magazine centrefold, have also been filmed by Asian Wedding Videographers at many splendid Asian wedding venues in The United Kingdom including the new Salman Khan Bollywood movie Salaam e Ishq filmed on London's Trafalgar Square, where the Saffron, Gold, Red and Burgundy wedding costume contrast perfectly Nelson's Column in Trafalgar Square. How does an Asian Indian Groom feel at his Wedding, and what are his emotions? It is impossible to describe in words, the emotional feelings of the Asian groom, when he rides the White Wedding Horse at the wedding venue. You need to be at the Asian Wedding, and walk with him as he arrives at the wedding venue, see him when he waves his traditional wedding sword above his head and smiles and shouts at the wedding guests as the tinsel is thrown, and Dhol Drummers play, to experience his exhuberence and great joy and sense of tradition which is happens once in a lifetime at his Asian wedding, and will never be experienced again. The White Asian Wedding Horse has carried the Asian Groom in Sunshine, fog, cold and in pouring rain at the Asian wedding venue. 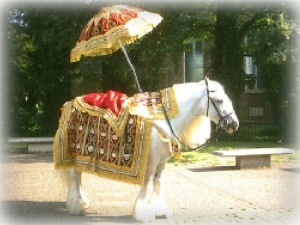 Wedding Horses are Professional and experienced suppliers of The traditional White Asian Wedding Horse in the UK. Historically, in Asia, on The Wedding Day, the Asian Groom and his family walked from the Asian groom's home to the brides home village. 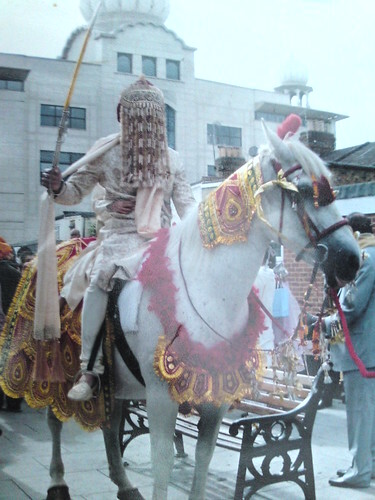 Now, at a traditional Asian Indian Wedding in the UK, the Asian Groom arrives at the Asian Wedding venue mounted on a White Wedding Horse. The Best Man is normally the brother of the groom and will carry the Large Traditionally Decorated Indian Wedding Umbrella which he holds over the Groom and his Nephew who will sit on the Wedding Horse in front of the Groom.